Bald eagle, Jasper National Park, Alberta, Canada. Another bird! I haven’t had much luck with the weather for shooting landscapes, but I’ve been fortunate to get a few bird photos instead. This bald eagle photo was taken along the Athabasca River in Alberta’s Jasper National Park, just north of Banff, Canada. After a crappy morning (I was minutes late to Moraine Lake for sunrise, and missed the VERY brief glow of good light on the peaks there by mere seconds), I took off again and headed north, this time to Jasper National Park, one of my favorite places. It was an awesome drive up, listening to some bluegrass, and riding thru the mountains with the window down, I quickly forgot about the misfortunes of this morning’s shoot. Arriving in Jasper, I checked a local coyote den that I found a few years ago, and saw a couple of pups from this year’s litter. Poking around a little more I found this bald eagle, and, after a very cautious and slow approach, I was able to fire off a few snapshots before the obligatory tourists came running and scared the bird away. One thing about shooting in popular parks like Jasper and Banff is it does tend to increase your ability to make your first shots count – as you quickly learn that you probably won’t get to spend too long with the subject. It’s frustrating, for sure. So now I’m sitting on the floor in this little Thai food place, checking emails and updating the blog. The weather shows promise for the evening, so hopefully I can get something decent when I head out shortly. The forecast isn’t good for the next few days, so I think I’ll not spend too long around here, before heading off again and shooting for Alaska. What’s crazy is I’ve driven from Atlanta, GA, to Jasper, Alberta, Canada, and I’m just barely halfway to my destination. My poor ole truck is probably sick and tired of me sitting in it. Ill be glad to finally get out, put a backpack on, and do some hiking. This entry was posted in Birds, Canada, Jasper National Park, Wildlife on June 20, 2007 by Carl D.
Well, who cares about landscapes when you can hang out with these majestic birdies…? Wonderful shot. Be safe Carl! Thanks for the post, buddy. 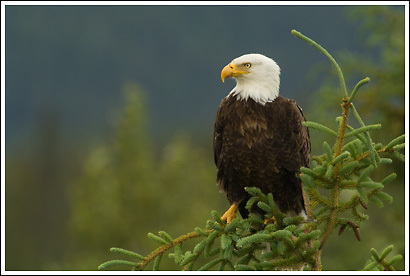 Yeah, this was the first bald eagle I’ve photographed in Jasper, so I was happy with this opportunity. Of course, I went out this morning, and didn’t get anything .. wind was blowing a gail. The light was nice just about everywhere except for the mountain peak I was vainly trying to photograph. I did have a nice breakfast, though. Great eagle photo! And it doesn’t look like Homer – that is a bonus! Bummer on your weather – I sure know that feeling all too often. Thanks for the comments by the way. Interesting on the elk calves, I wondered if you would have better luck finding them up in Jasper since elk are so prevalent – how do they hide those guys so well! If you are hitting the road, do drive safe. Nope, no elk calves around here. I’ve never seen any, and I come through this time every year and look for them. Haven’t seen this eagle again since tourist # 11 057 scared him off.